This is the Chinese character for Biang Biang Noodles, composed by a mere 57 strokes.Biang Biang Noodles refer to a type of noodles popular in China's Shaanxi province.The Chinese character "Biang" is one of the most complex Chinese characters in contemporary usage, although the character is not found in modern dictionaries or even in the Kangxi dictionary. 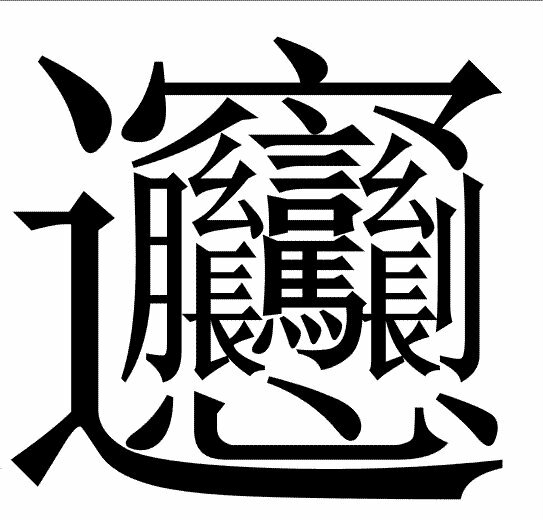 Due to the fact that the Chinese character for "biáng" cannot be entered into computers, phonetic substitutes like 棒棒麵 or 梆梆麵 are often used. Heck, it even looks like a pot of noodles on the stove. It is sort of funny that the lower central character there is very clearly 'horse'.